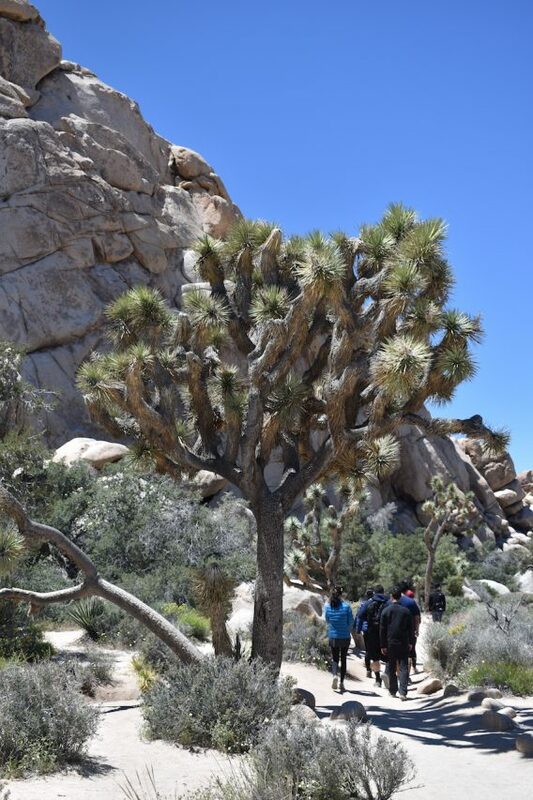 Joshua Tree National Park, as the name implies, has plenty of Joshua trees and interesting desert plants. The rock piles are unique and a lot of fun to climb. Joshua Tree National Park’s popularity is shooting through the roof, increasing by 30% in the last two years. This is straining its resources. The park is fun, approachable, and close to the Los Angeles metro area. Joshua tree forest – Park Boulevard and the road to Key View. Rock piles – Hidden Valley and Jumbo Rock areas. Get an early start. 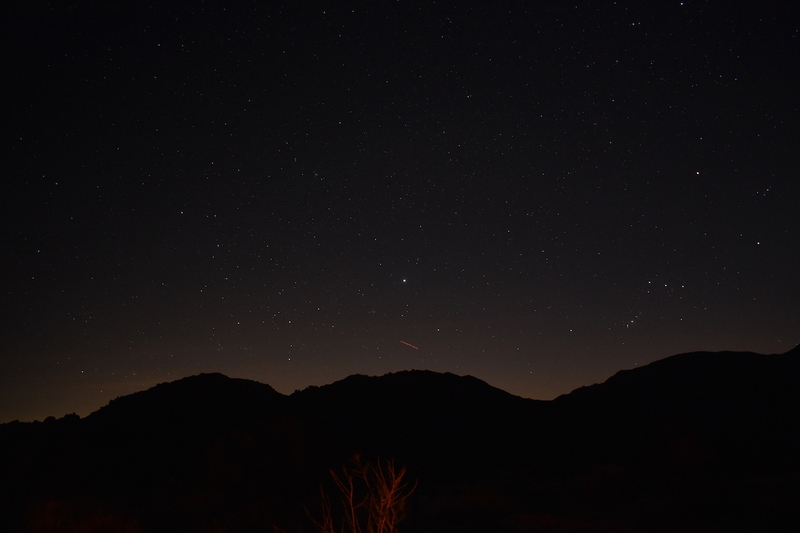 Enter from Twentynine Palms and the Oasis Visitor Center by 8:30. Get tickets for Key Ranch tour if possible. Drive back to Park Boulevard and stop at Skull Rock and Jumbo Rocks. Climb the rocks. Take the Key Ranch Tour. Visit Barker Dam if time allows. 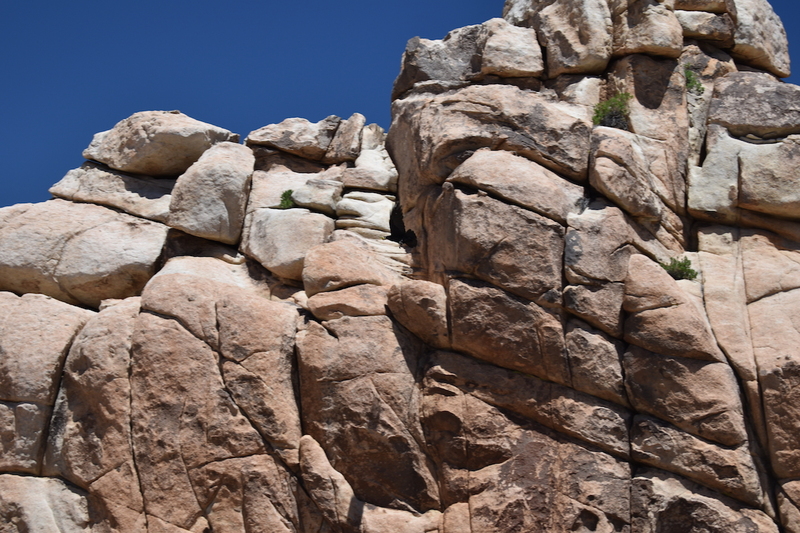 Hike the Barker Dam trail if interested in history. Drive to Key View. 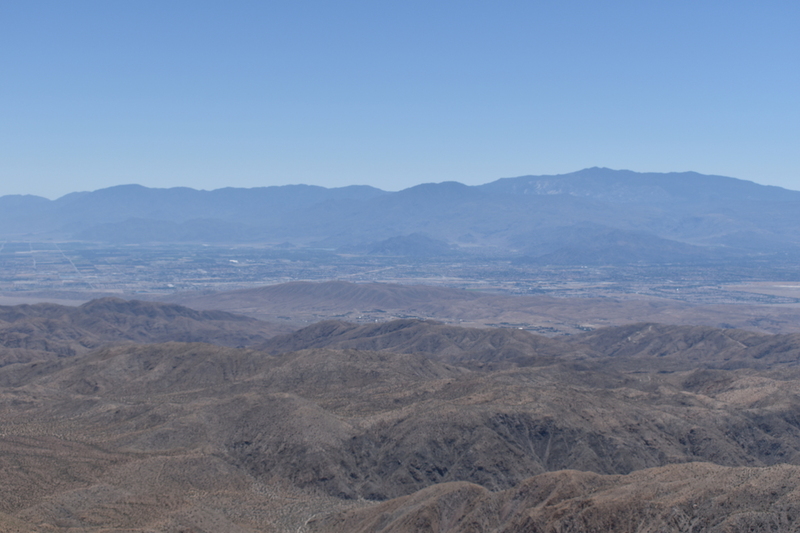 Enjoy the view of Coachella Valley, Palm Springs, and Palm Desert a mile below. Drive to Hidden Valley. Hike the Hidden Valley trail. Climb the rocks. Drive to Joshua Tree Visitor Center and exit the park at Joshua Tree. Stop along the way to get close up view of Joshua trees. Come back to the park after dark. On most nights, you can see brilliant stars in the dark sky. Loretta had a near death experience. Okay, I’m exaggerating here. After we visited Cottonwood Spring, as we walked past a bush on the side of the trail (she, of course, was ON the trail because she would never disobey the park service and walk off trail), we heard a rattling sound. I immediately looked at the source of the sound and sure enough, there was a snake that slithered deeper into the bush with its rattle clearly visible and shaking. She freaked out and cringed every time there was bush near the trail from that point on. The snake didn’t bite her, but what if the snake did bite? I thought about what I would do if the snake bit her. Since the visitor center down the road closed 15 minutes ago, what was the likelihood that a ranger was still there? Would he/she know first aid? Where was the nearest hospital? I’m glad I didn’t have to answer these questions because she was safe and sound and so was the rattle snake. I knew there are rattlers in the desert, but I didn’t want to see one. I’d much rather see a bighorn sheep or a rabbit. Something that is not lethal. Joshua trees are weird. I wouldn’t call them pretty, just different. They look liked a Saguaro with pine needles at the tip of the branches. 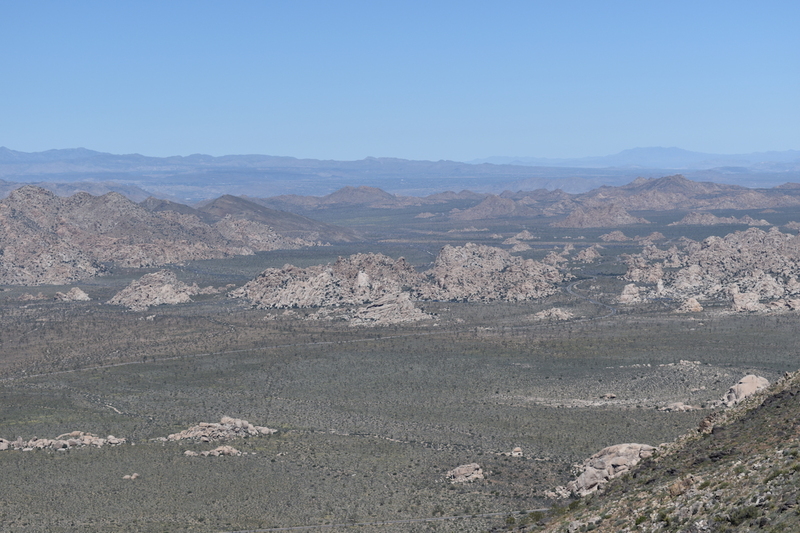 The densest groves were near the west entrance by the town of Joshua Tree, and the road to Key View. It was easy to take a closer look because there were plenty of pull outs to park the car. The tree was named Joshua by early Mormon settlers, because it looked like the biblical story of Joshua raising his hands in prayer. There is some dispute to this version of the story. The park should have been named “Desert National Park” because it really celebrates the desert landscape and plants, a lot more than just Joshua tree. Ryan Mountain trail was just the right size for our hiking preference because the round trip was three miles with an elevation change of 1000 feet. This was just like the portion of the Bright Angel Trail we hiked two days ago at Grand Canyon. 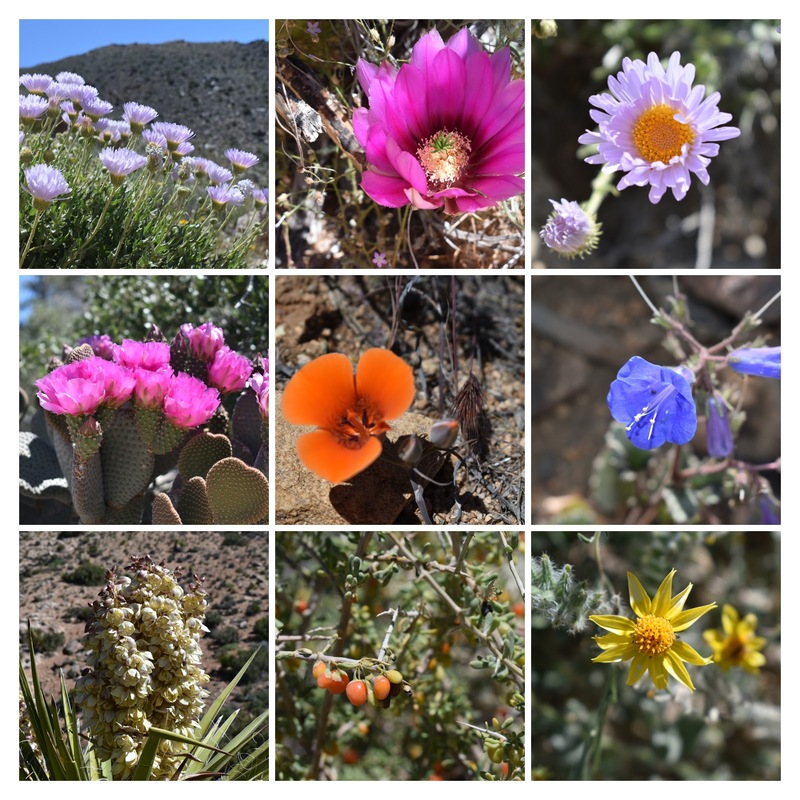 Desert flowers were in full bloom on this spring day and we saw desert flowers in yellow, red, purple, pink and white. Pinkish purple flowers were in full bloom at the tip of the Beaver Tail cactus. The birds chirped, calling each other as they flew from white flower to white flower at the tip of Joshua trees. We hiked up the steep part of the trail, but as we neared the top, it flattens out and the wind picked up dramatically. Anything that wasn’t tied down would have blown off. The wind was so strong we had to take shelter between a rock pile and Mojave Yucca plants before we can eat our snack. We looked down at the desert floor 1000 feet below. The cars going down the highway looked like dots moving on a ribbon of asphalt. One thing I noticed was the age of the hikers and the type of people on this trail. We were in our mid-fifties and we were definitely part of the oldest 10% of the hikers since most hikers were in their twenties and thirties. Because of the time of the year (May), we did not see many children. While we were huffing and puffing up the hill, with frequent breaks to take pictures of wild flowers (okay, that was just an excuse to catch my breath), these youngsters hiked up with barely a heavy breath. While there were a lot of people on this trail, most looked like the “National Park People”, with sturdy hiking shoes and poles, and a polite nod or hello as we passed each other. There was one lady that looked out of place in a long dress but with hiking shoes. I don’t think there was a practical reason why a dress was not good for hiking, but it looked strange. We saw weird piles of large rocks as we drove up to Hidden Valley. There was – surprise – a hidden valley surrounded by these piles of rocks. We arrived at the city of Bedrock from the Flintstones! I kept expecting Bamm-Bamm and Pebbles to come around the corner. Hidden Valley was a wonderful playground for climbers of all ages. We hiked the one mile loop among the boulders that precariously perched on top of each other that were 100 feet or higher. The rocks were coarse which gave hiking shoes and sneakers great traction. It was easy to walk up at a steep angle but the coarseness is hard on the fingers, hence experienced climbers wore gloves. At Hidden Valley, we had a mixture of “Theme Park People” and “National Park People”. The parking lot was crowded and filled to capacity. A ranger directed traffic and I had to wait several minutes for a parking spot to free up. A lady who drove a Honda Accord from Southern California tried to get around me and pull into the parking spot I was waiting for. I had to honk at her to prevent her from stealing my spot! We had our usual Subway lunch at a nearby picnic table under bright blue sky and perfect temperature. Just as we wrapped up our lunch, a busload of people who spoke Russian disembarked and poured onto the trail, speaking loudly. On the trail, the “Theme Park People” were in more of a hurry, were less likely to say hello, and were less likely to step aside and wait for people to pass. The park encouraged people to step off the trail and climb on the rock piles. That dispersed the crowd somewhat. Some young men climbed to the top of several rock piles, yelling and echoing each other, and had a great time. It shattered whatever quiet is there with all the people, but this part of the park was theme park territory anyway. Key View road took us to an viewpoint that looked down on a valley a mile below, and across to a mountain 10,000 feet at its peak. The view was dramatic but hazy, the result of pollution from Southern California. The drive to the viewpoint went through a very nice Joshua tree forest, with dense groves of Joshua trees. The wind on top of this mountain blew at more than 50 MPH and I could be blown off my feet if I wasn’t careful. The wind was relentless and strong, and after only a few minutes, I felt the windburn. A quick walk around to admire the view that was marred by pollution and a few quick pictures were all we could do before we returned to the calm of our car. 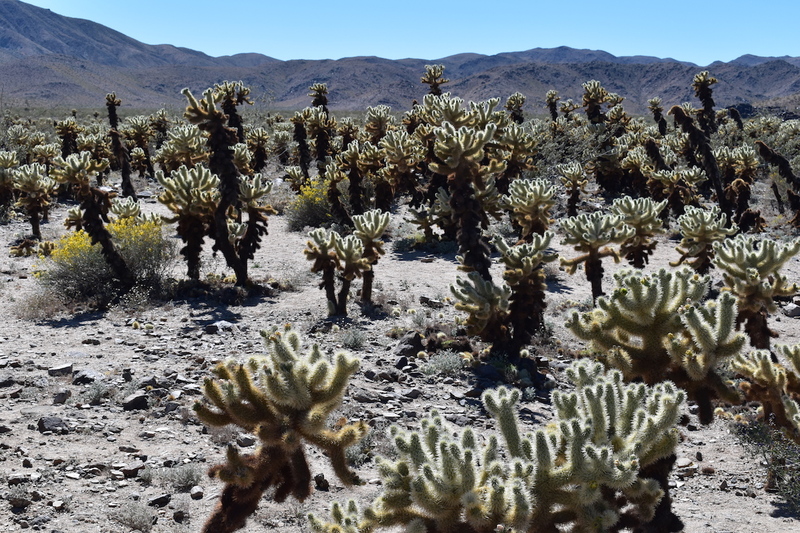 Cholla Cactus Garden was a short trail that looped through a heavy concentration of Cholla Cactus. Strangely, it was in the middle of tough scrub brush and other uninteresting plants. These cuddly looking cacti, otherwise known as teddy bear cactus, was anything but cuddly. They came in all shapes and sizes, most had a dark brown base with green tops. They looked like a brown teddy bear with a green head. Sections of the cactus fell off and attached to anything that touched it. A lady went a few feet off trail to get a picture and came back with several of these “fur balls” attached to her pants and sneaker. Good thing she wasn’t wearing shorts. 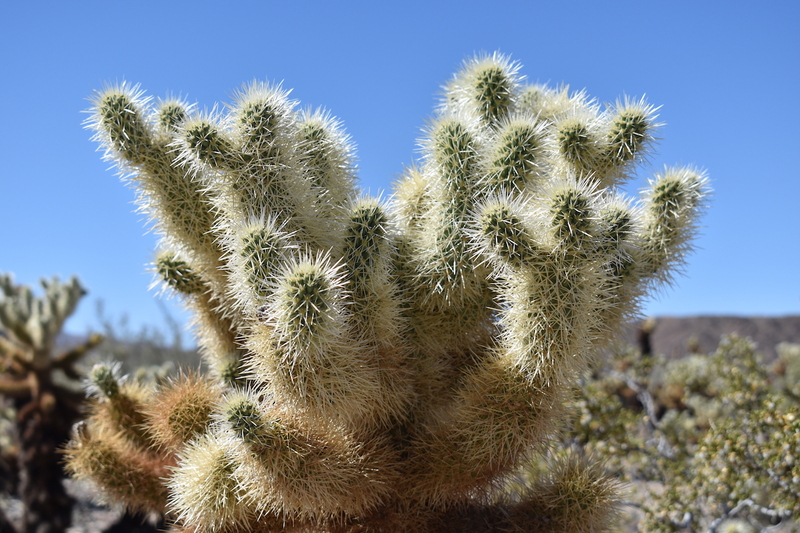 Cholla cactus was one of those plants that you really want to touch, but knew better. People and pets would only touch it once because the thorns dug into the skin and were very difficult to remove. 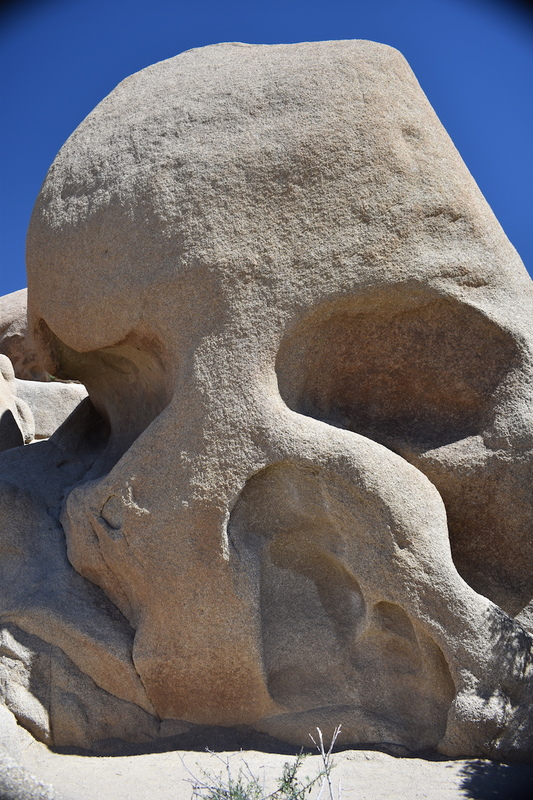 Skull Rock was just as the name says – a rock that looked like a skull. People lined up to take pictures of this rock. There was a trail around the rock, but it was not particularly interesting. This was like taking a picture in front of Tree of Life at Disney World, very much theme park territory. Jumbo Rocks was smaller and less crowded version of Hidden Valley. It was very climbable, just like Hidden Valley. While not as big, it was equally enjoyable. The drive to Cottonwood Visitor Center was long (35 miles) as we traveled over a mountain and into flat desert. The transition from high Navajo desert to low Colorado desert had pronounced vegetation change. Shortly after we turned onto Pinto Basin road, we didn’t see Joshua trees anymore, nor did we see the signature rock pile formations. It was just flat desert and not very interesting. 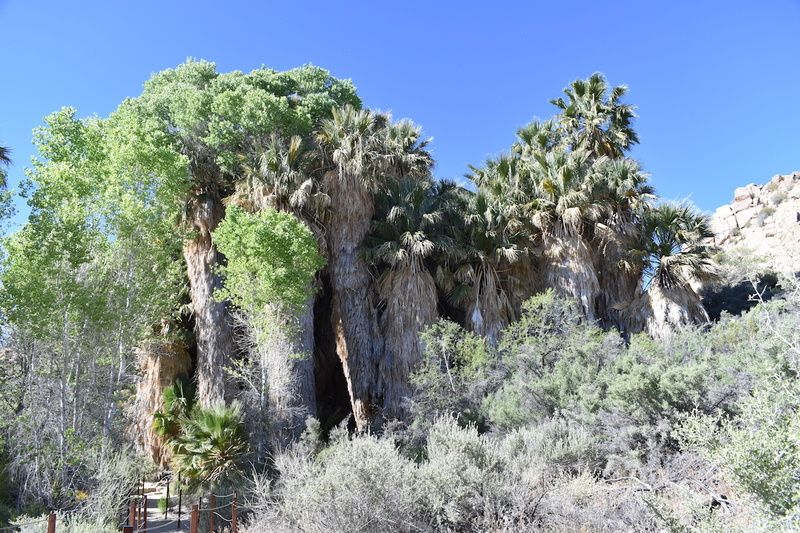 There was a grove of tall palms on the southern end of the park called Cottonwood Spring. The palms were very tall, with large green leaves and densely clustered together in a circular way. The inside of the cluster was very dark and seemed like a good shelter until you see the swarm of insects in and around the trees. I don’t know why they call it Cottonwood Spring when the trees there are palms. 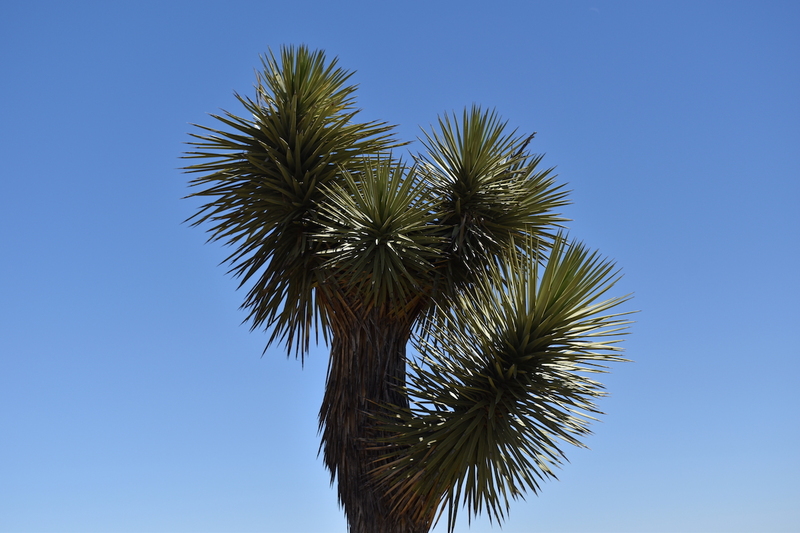 Some people thrive only in specific environments, just like Joshua trees only grow in elevation of 3500 to 4500 feet. Find the right environment and you will thrive. 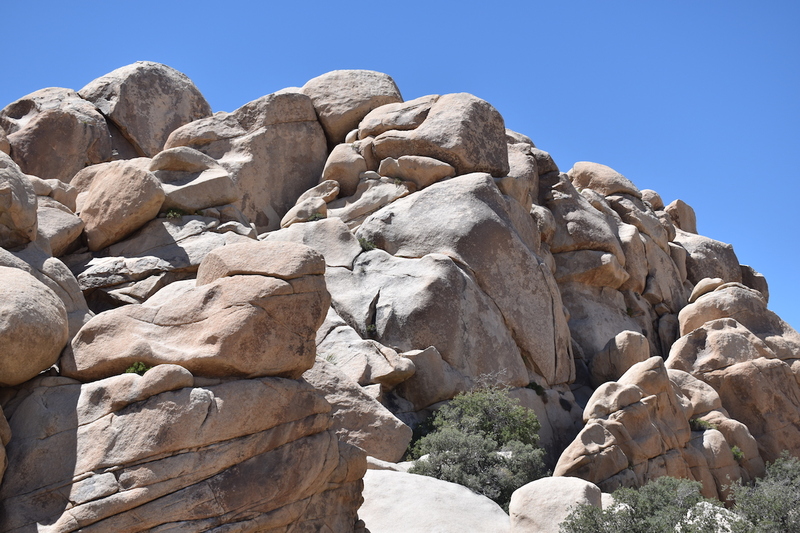 Joshua Tree is a fun park to visit, with a good mixture of activities and sights. 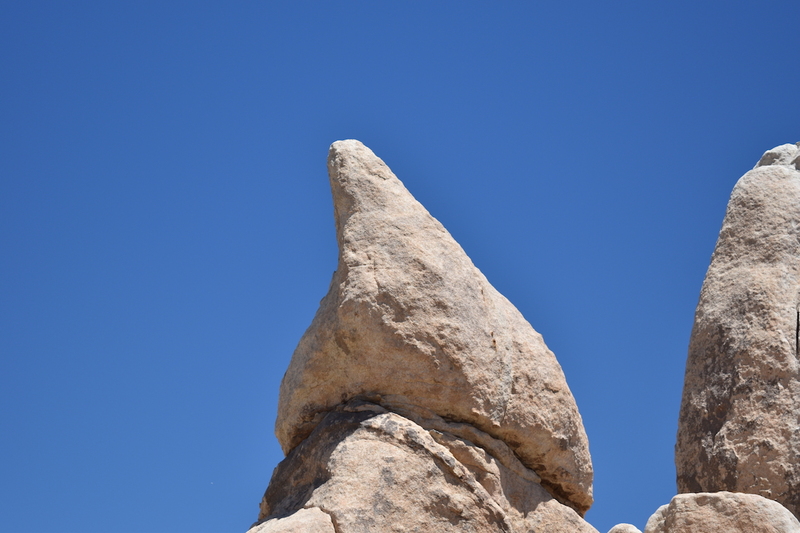 There are two main features to this park, the namesake Joshua tree, and the rock piles. The tree itself is unique but not particularly pretty. The rock piles are interesting to see and really fun to climb. Kids and young adults can have a lot of fun climbing these rocks like they are on a playground. Park Boulevard in the northern part of the park is where all the action are. Joshua Tree is more popular than ever, and the facilities are showing the strain as it attracts more “theme park” crowds. As the park attracts more people, the allure of solitude among the crazy looking rocks and trees diminish. Places like Hidden Valley starts to resemble Adventureland at Disney World. 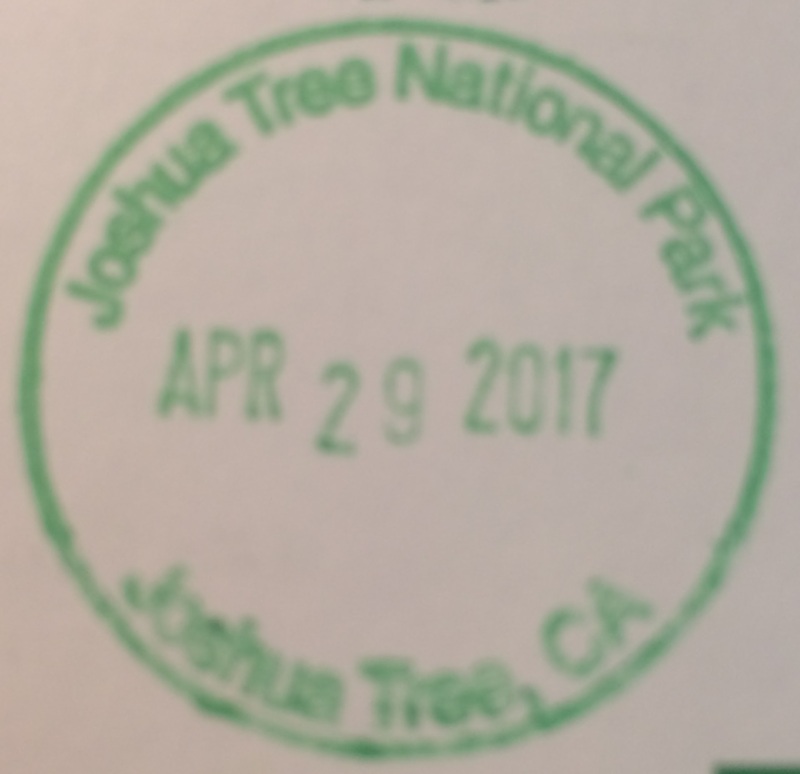 Have you visited Joshua Tree? Leave a comment below on your experience. Click on the Follow link and get an email when new postings are available. I will not share your email so no worries. Oasis Visitor Center is the main visitor center. Go there first. Cottonwood Visitor Center and Joshua Tree Visitor Center are small and limited. Twentynine Palms is a good place to stay with good services. Joshua Tree is a good alternative. Focus on the northern part of the park and Park Boulevard. Go as far south as Cholla Cactus Garden. Tour Cottonwood area only if you have time. Get tickets on the day of your visit for Key Ranch tour (for a fee) at the Oasis Visitor Center, starting at 8:30. The tour is at 2:00. There are many short (~2 mile) hikes and some longer ones. Depending on the time of the year, the longer trails can be difficult in the hot desert sun with very little shade. Bring lots of water. The desert is dry and dehydration is a real problem any time of the year. No food or water is available in the park. Bring all you need. Spring is the best time to visit, with plenty of wild flowers blooming and pleasant temperatures.